Promotion on our first morning Istanbul Bosphorus cruise taken during April-October. You’ll always get the best price for “Zoe Yacht” owner-direct on this website, no-where else. From your European-side city-center hotel or cruiseship, for direct bookings via this website. See the best of Istanbul in our short circle Bosphorus cruise by boat (kısa boğaz turu), a great alternative for people with little time but still wanting to do a short Bosphorus cruise. After breakfast, why not enjoy two hours of bliss – Glide along the shores in comfort aboard a well-maintained motor-yacht to see the top sights each way, including the Bosphorus Bridge, Dolmabahçe Palace & Rumeli Fortress. In this full Bosphorus cruise tour (uzun boğaz turu), you’ll do a half-day trip from Istanbul with a stop to visit Anadolu Kavağı, a picturesque village overlooking the mouth of the Black Sea. Hop off on the Asian Side for an hour for a stroll and lunch at one of the little fish restaurants by the shore. 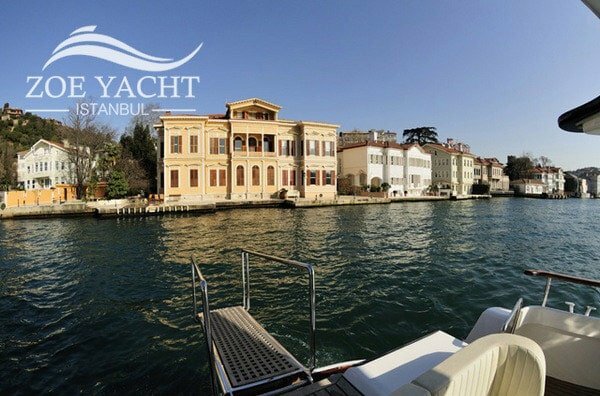 Admire views North & South of the full Bosphorus Strait, then get on your boat again to go back to the city. 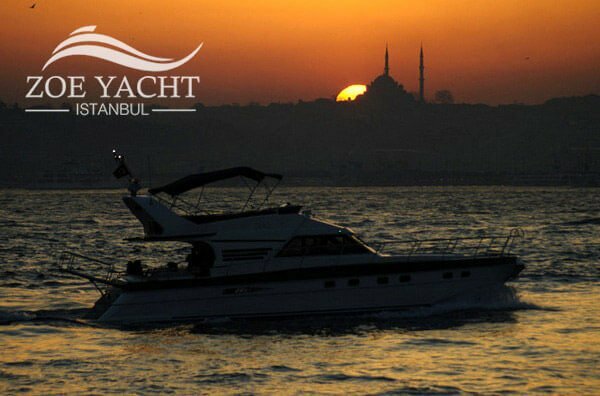 Start a special evening with cocktails during a Bosphorus cruise at sunset time (akşam boğaz turu). After seeing the best of Istanbul’s tourist attractions from the water, we’ll leave you to your favorite Istanbul restaurant to continue. Combining views by day and night, this offers the best Bosphorus tour experience for a romantic proposal, a special occasion or birthday party. Enjoy fine dining, an evening adventure and panoramic views of Istanbul city in this magical Bosphorus cruise by night (gece boğaz turu yemekli). Feast on mezes and crudites, or specially selected Turkish food and wine. Experience Istanbul illuminated by night while you relax onboard with friends or family in this beautiful Istanbul Bosphorus tour. A boat party is a fun way to celebrate any occasion in Istanbul, so come aboard and enjoy your birthday party, family reunion, marriage proposal, anniversary or wedding on the water. Enhance your private Bosphorus tour on Zoe Yacht with a range of options (costs extra Euro/TL per person) including meals, drinks, snacks, cakes and flowers or a English-language tour guide available during online booking. We have a fleet of reliable motor-boats in Istanbul ready to offer you for all occasions and group sizes. Zoe Yacht is ideal for up to 12 guests and departs every day all year around. There’s many great advantages to doing a Bosphorus tour in Turkey privately – enjoy a more personalized and peaceful experience, stay clear of the noise and crowds on the public Bosphorus tour ferry; sehir hatlari bosphorus cruise, dentur avrasya or turyol boat. Instead get a complimentary pickup and drop back at your hotel or cruiseship docks when you book a boat tour via this website. Welcome to Zoe Yacht Bosphorus Cruises in Istanbul, Turkey. 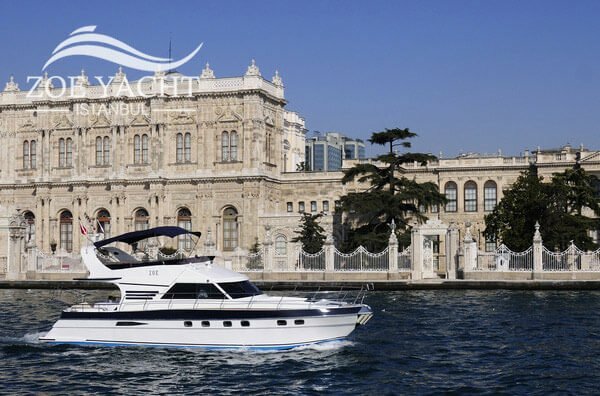 We’re an award-winning locally owned, crewed and managed Turkish flybridge motor-yacht, 17-meters/55-feet long, ready to take you out on a deluxe harbor tour of Istanbul, the Bosphorus Strait, Golden Horn, Princes’ Islands, Marmara or Black Sea. Our private cruises sail every day and night, at regular departure times in the morning, afternoon and evening, through all seasons be it winter or summer. Taking up to 12 guests with ease, our spacious tour boat is perfect for couples, families and small groups including tourists, visitors, cruiseship passengers and local residents or companies. A private boat tour offers you a higher level of privacy, flexibility and luxury as well as the possibility to skip the lines, customize your Bosphorus cruise schedule, explore parts of the Bosphorus Strait not possible by bus or other Istanbul tours, hop on hop off at different stops, have a party with your friends, enjoy a special day out with your family or stop in a romantic spot with your loved one along the way. What Bosphorus tour to take? We include a choice of short, long, half day or full day private Bosphorus tours and day trips from central Istanbul: Take a sightseeing tour for a two continents tour of Asia and Europe, a moonlight dinner cruise on the Bosphorus, a romantic sunset tour or an airport transfer to meet your flights. You can also rent our boat from a few hours long to the whole day for a custom boat trip to the Princes’ Islands or Black Sea for swimming, fishing and sunbathing. Food and drink lovers can savor breakfast, lunch or dinner over a skyline of stunning sights such as Rumeli Hısarı, the Blue Mosque, Maiden’s Tower and Ottoman mansions. Our Turkish cuisine and menus are provided by one of Istanbul’s reputable fish restaurants. We’ll collect you from almost any neighborhood located in central Istanbul’s European-side (when you book direct), including from hotels in Sultanahmet or the Old City, Taksim, Ortaköy, Karaköy, Galata Bridge area and Eminönü, from the docks of Kabataş, Kuruçeşme and most tourist areas along the Bosphorus and Golden Horn. View all available hotel pickup areas and docking points here. On our website you’ll find unique activities and things to do in Istanbul including our tours and boat rides with itineraries, Bosphorus cruise maps, travel guide, costs and prices. Prices and payments are in Euro/TL and can be booked online now instantly, securely and owner-direct. Why Book our Bosphorus Tour? Recommended by major travel sites including Travel + Leisure, BBC Travel, Rough Guides and The Guide Istanbul. Check real-time availability by date and time and book online - it’s instant and secure. A truly magical experience… it was certainly the perfect way for friends to celebrate a special occasion. Thank you for all the lovely details, like the flowers and your staff’s helpfulness.